Earlier this week, I had dinner with Elysse in Oakland. I’d been feeling pretty dumpy and gross the previous week, so I decided to try to actually, like, WEAR some of my cute dresses this week. I tend to get lazy and just snap phone pics for Instagram instead of taking actual outfit photos, so maybe one day I will get some better quality pictures of this outfit BECAUSE I LOVE IT. At first I was looking for fun dresses to wear to a wedding I went to last month in Hawaii. 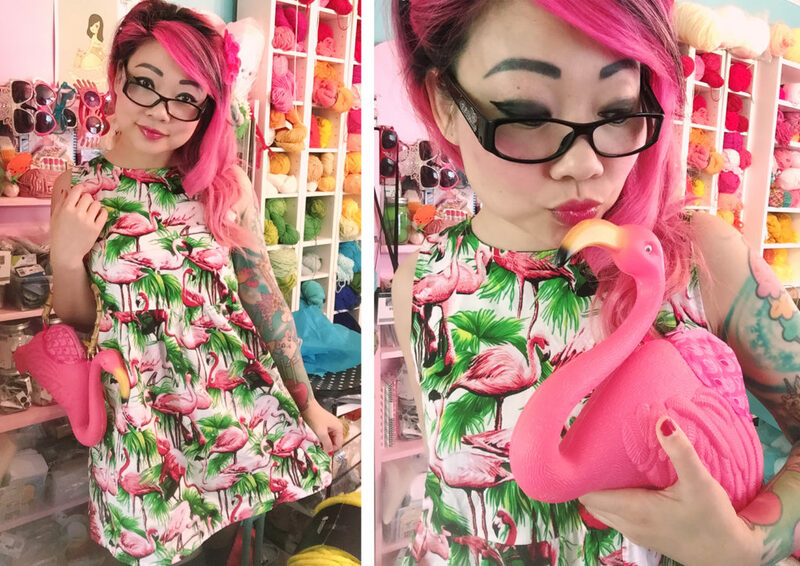 I ordered this flamingo wonder from Tallulah’s Threads, which is based in the UK, so I didn’t get it in time (no fault of theirs, just bad timing on my part!). Oddly, I decided to wear this on a totally gloomy day here in SF. 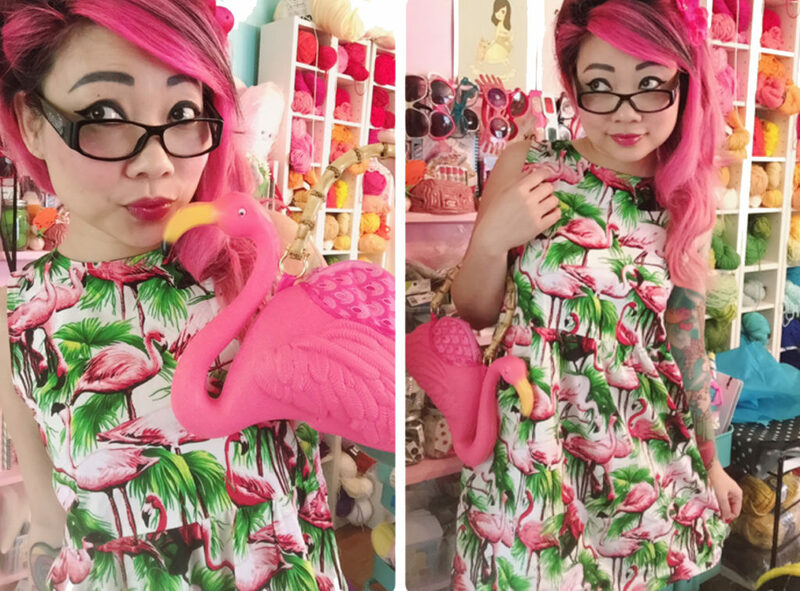 So once I got on this flamingo kick, I really super wanted A FLAMINGO PURSE. I googled around and found this gem on Etsy. I really loved it, but I didn’t know if I wanted to spend money on something I could probably make, since I actually have some lawn flamingoes leftover from an old craft fair display. I also thought about crocheting one. But knowing myself, I have a million crochet projects to finish, so I just went ahead and purchased this one to support the originator. It’s pretty terrific and also feels like a new friend. 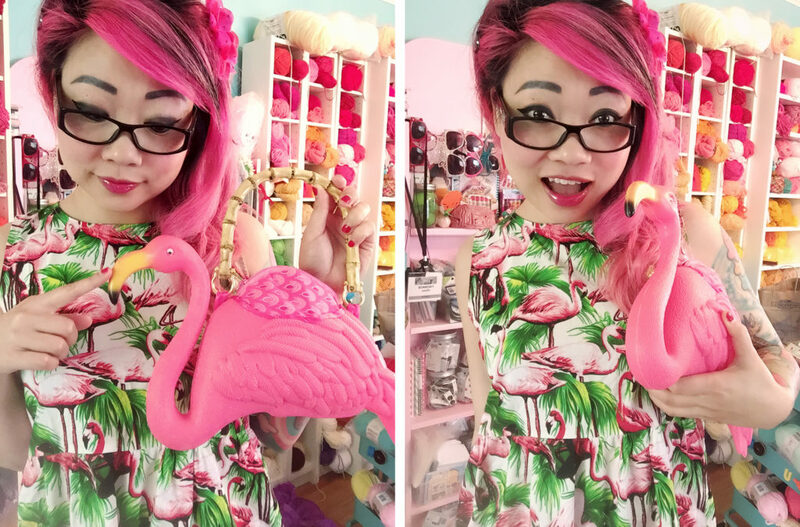 Now I want to hunt around for more cute flamingo stuff! I love the dress and the bag! I’m really glad that you bought the bag instead of making your own. It’s great to support each other. You are so cute and fun, ❤️ you 4ever! Thank you, Tanya! <3 I'm really trying to put myself on shopping hiatus, though. :X It's hard. I need to go to Emotional Shoppers Anonymous.